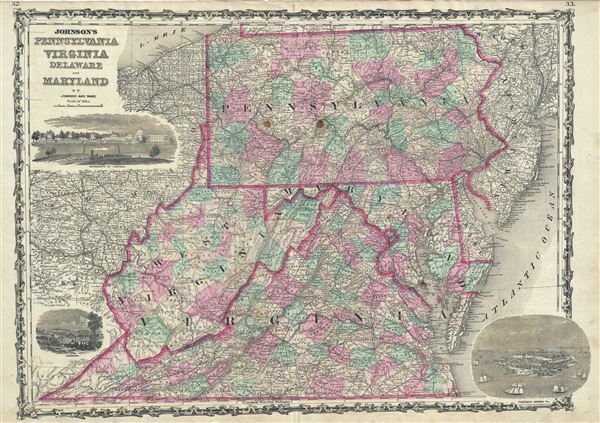 This is a beautiful example of Johnson and Ward's 1863 hand colored map of the Middle Atlantic States, including Virginia, Maryland, Delaware and Pennsylvania. Offers a fascinating snapshot of these north-south borderlands shortly following the outbreak of the American Civil War. The map shows all four states in full with color coding according to county. A beautiful and historically important map, this is the first edition of the Johnson's map to depict a partitioned Virginia. It also includes three beautiful woodcut vignettes: the University of Virginia, Richmond, and Fort Monroe. This map went through several different states and was updated regularly throughout the Civil War. Features the strapwork style border common to Johnson's atlas work from 1860 to 1863. Published by A. J. Johnson and Ward as plate nos. 32-33 in the scarce 1863 edition of Johnson's Family Atlas. This is the second edition of Johnson's atlas to bear the 'Johnson and Ward' imprint.